YES, we know the freshly refinished floor looks like glass, but it is in reality less slippery than when unprotected by our slip-resistant finish. NO, we don't hire people without the proper documents. All forms including the I-9 and W-4 are on file. YES, many of us have had years of cleaning experience. The average time employed at CMC Inc is 7.6 years. NO, we do not hire "subcontractors" as cleaners. That would be a misclassification of workers and is illegal. YES, our office is in the Avon Industrial Park. You are invited to visit Monday through Friday 9:30 am to 6:00 pm. Please call first so we can put your name on the welcome board. NO, we don't read what is on your desk, or open drawers, or take what isn't ours. We are honest and proud of it. All staff are specifically trained in this regard. YES, we all speak and understand the English language. NO, we don't just put a warm body into your building. Like any business, we train, supervise and coordinate our teams. Our classroom has a complete library of training films with such exciting titles as "Ground Rules for the Janitor," "Floor Stripping VCT Tile," "Care and Use of the Pro-Team Vacuum Cleaner"! YES, we do take all major credit cards. Don't those points add up by the end of the year? NO, we can't use your discount cleaning chemicals. Our insurance covers us while using top quality equipment and chemicals. Your safety committee has copies of anything stored in your facility in the form of MSDS (Material Safety Data Sheets). 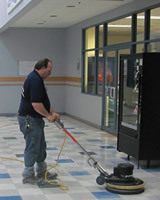 YES, our cleaning team members typically live within twenty minutes of your facility. NO, you may not hire our people to work 'side jobs' for your company. We won't solicit your workers either. YES, we want you to call, fax, or e-mail our office with special requests. NO, we don't bring family members, children or friends to work with us. We are professionals and appreciate your trust. YES, we have Contractors Liability Insurance - $2,000,000.00, Workers Compensation Insurance, Bonding, statutory automobile coverage. Would you like to have a copy? YES, we run background checks on all cleaning team members because we verify the honesty of all applicants. We check all references for accuracy and content. YES, we require all team members to be in a clean uniform shirt each shift. The Team Chief must be able to ensure everyone is in the proper area of your building. 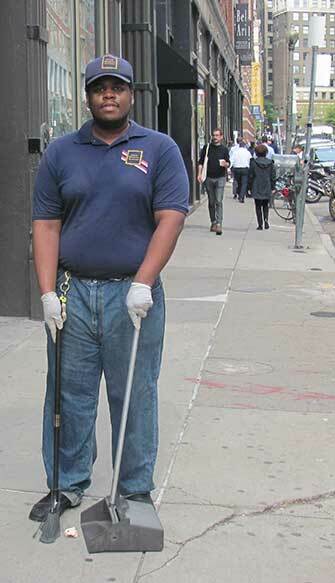 If you work overtime, you may easily identify and greet our cleaners.